Daisy Cottage01535 640271work Self-cateringDaisy Cottage is a recent barn conversion situated in the tiny hamlet of Buckley Green. 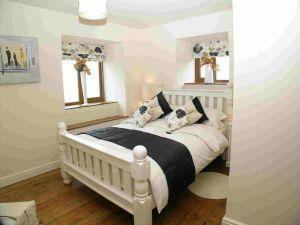 The cottage is stylishly furnished and enjoys the benefit of underfloor heating from a ground source heat pump. In an elevated position with spectacular views over Ponden Reservoir and open countryside, excellent walking can be enjoyed direct from the cottage to Bronte Waterfalls and Top Withins. Haworth is 2 miles away, where there is an excellent selection of cafes and shops and the Keighley and Worth Valley Railway. Pets are welcome at the property and a welcome pack with tea, coffee, sugar etc. is provided. The arrival time is 3pm and departure is by 10am. The changeover day is normally Saturday, but this can be flexible. All linen, towels and fuel are included in the price. Freeview TV. Underfloor heating. Children welcome from any age. On entering Stanbury village from Haworth take your first left after Stanbury School into Back Lane. Follow the road until it splits, then turn right. Continue for approx 1/2 mile until you reach Buckley Green, Bottom Farm on your right. Go down the drive all the way to the double garage - Daisy Cottage is on your right.